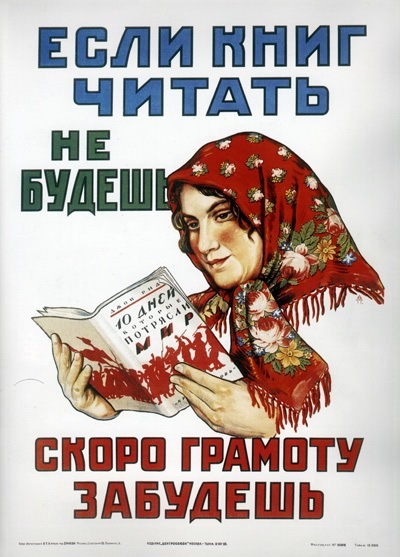 This early Soviet-era poster promotes reading as a way to stay literate. Do you know what the easiest thing to learn when studying Russian is? It’s reading! From never reading a single word of Russian you can progress to reading “War and Peace” in a matter of hours (how many hours will depend on your memory). You will become more confident in your ability to learn Russian. You will never be totally lost since you’ll be able to read street signs. You will be able to check your restaurant bill and avoid getting ripped off. You will be able to impress a lot of folks with your new skill. You will be able to learn the lyrics to some of the most awful Russian pop tunes (don’t worry if you don’t understand a word; many of these songs make no sense anyway). Most importantly, since Russian has so many words borrowed from other languages (most notably French, German, and English), you will actually understand quite a few words – шоппинг (shopping), компьютер (computer), инвестиция (investment), менеджер (manager), коттедж (cottage), журнал (journal), ресторан (restaurant), пляж (beach, but in French it sounds just the same la plage), картофель (potato, which sounds just like the German, Kartoffel), etc. You may want to get this French Words App for iPhone to learn more French words. And those are just бытовые слова (everyday words). As you read more specialized texts, such as financial or science news, you will encounter even more familiar-sounding words. So if you don’t yet read Russian, let’s start. We have a great article about Russian alphabet right here on the MasterRussian site. It has audio samples of how each letter sounds when read. There are 33 letters in the modern Russian alphabet, but you will only have to memorize the pronunciation for 31 of them (the other two are silent). The good news is that there are no bi- and trivocals in Russian (unlike in English with its “th”, “ae”, etc). Plus you don’t need to worry about which sounds not to pronounce (unlike in French). Don’t worry about sounding just right since your main goal right now is to start reading. Now, keeping the guide to letters and sounds handy try reading some shorter words. You should understand these words without translation once you read them since when read correctly they should sound the same or nearly the same as they do in English. Now you are ready to move on to longer words with a less favorable consonants-to-vowels ratio. amazing, I only recently started to learn to use cryllic letters and sounds..seems less daunting now, thanks.I didn’t get all the words but most I did. I would love to learn russian, but i lack self discipline. with your help i might manage! Actually, the poster says “if you don’t read books, you will forget how to read at all”. Грамота means literacy, not grammar.